Megan Govindan is a West Virginia native, with a passion for Community Food Systems. She serves as President of the Board, working to cultivate community gardens to facilitate food system change in West Virginia. She is a Registered Dietitian Nutritionist and works as a Teaching Associate Professor in Human Nutrition & Foods at West Virginia University’s Davis College of Agriculture, Natural Resources & Design. She also co-owns The Wheeling Feeling with her sister, and is working on completing her PhD in Human and Community Development. Joey moved to Morgantown nearly ten years ago for school and decided to make it his forever home. He is a graduate of the WVU Geography program and works as a Senior Strategist at Downstream Strategies in Morgantown. Joey analyzes complex development issues across Appalachia with a special emphasis on the sustainable reuse of former industrial and mine sites. He has been a land-sharing member of Conscious Harvest since 2016 and is interested in building a community gardening movement in Morgantown. In 2019, Joey will focus on improving operations at Conscious Harvest's community garden. Olivia McConnell is Morgantown native and graduate from West Virginia University with a degree in Geography. Committed to bridging the gap between producers and consumers to improve food access within her community, she has worked with The Morgantown Farmers’ Market and Mountain People’s Co-Op. She is a backyard gardener and local foods enthusiast who has been playing in the dirt since her early childhood. In her free time she enjoys being outside, cooking, and reading. Valerie is a horticulturalist and Masters student in Nutrition & Food Science at West Virginia University’s Davis College of Agriculture, Natural Resources and Design. She manages the pepper varieties used in the Conscious Heat Project. Ted is a founding member of Conscious Harvest Cooperative. He enjoys nature, water and seeing people come together in harmony to achieve a greater good, peace on earth where humans feel sustained and empowered. He believes that community gardening and food and culinary education will be the backbone of the future where humans will coalesce together to create a shared vision, a thousand points of light. Ted is from Morgantown. He would like to see his hometown become a crucible for social change. Josh is a founding member of Conscious Harvest. He is the food policy research director at the Food Justice Lab at WVU where he is also finishing up his PhD in geography. His dissertation focuses on emergency food networks in the United States through a case study of West Virginia’s food banks and their network of local food charities. Josh is also a worker-owner of FIRSTHAND cooperative, a coffee company that provides resources for cooperative development and educational opportunities for consumers to engage with ethical supply chains and alternative economies in West Virginia and beyond. Mehmet is a seed farmer. His areas of focus include preservation and documentation of heirloom seeds, seed sovereignty, small-scale seed and vegetable production, sustainable farming practices, breeding open-pollinated vegetable varieties, restaurant farming, and value-added artisan food production.He is the co-owner of an heirloom seed company, Two Seeds in a Pod Heirloom Seed Co, based in Reedsville, WV. He also serves as a Service Assistant Professor in the Department of Geology & Geography at West Virginia University. Sam Horrocks manages Maryland Line Farm, a market garden and maple syrup operation serving the Morgantown area. 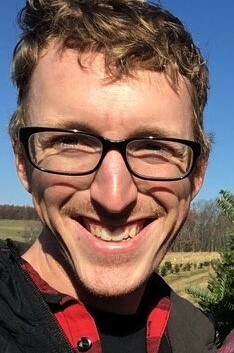 He is also a PhD candidate in English at West Virginia University studying the relationship of agricultural systems to human conceptions of the environment. He believes in the promise of community gardens to expand access to local, healthy food, and to help re-imagine our relationship with the land. He looks forward to helping CHC grow through 2019.